About 1400 kilometers south of Sweden's Arctic Circle lies the city of Gothenburg, home to the "Gothenburg sound" and numerous bands associated with it. 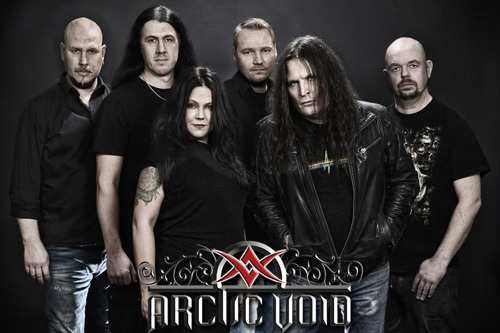 It's also the residence for heavy metal newcomers Arctic Void, who drop their debut album this month via Germany's Power Prog Records. Within a few songs, you can pick up on Arctic Void's musical direction: basically heavy power metal, built upon massive twin guitar riffage, informed by melody and groove, and laced with well-appointed keyboards. In that statement I would probably emphasize the immense guitar presence, more than anything. Which also allows for some equally massive and roaring guitar solos. Furthermore, if I would were to characterize the keyboards, they often remind me of the style found in early Eighties new wave music, like Mister Mister or Simple Minds. After these things, they offer two vocalists, one male and one female. As an analogy for their sound, Arctic Void reminds me of a mash up of Mob Rules and Rizon, a heavier version of the latter with keyboard appointments. What you won't find here is any metal ballads or anthems. From the start most everything is hard and heavy, fast and thunder, with only moments softness, like the breakdowns within Who I Am. And that song has enough groove to be called melodic power metal in an AOR wrapper. Now you're probably thinking, since I mentioned the Gothenburg sound at the start, that one of the vocalists is doing death vocals or growls. (Death vocals is not the only characteristic of the Gothenburg sound as we all know.) But you would be mistaken. As far as I could tell (or remember there are none). Olof Lindgren is somewhat of a classic metal vocalist: melodic, strong and forceful, a tad gruff and raw at times. Anna Samuelsson's voice is essentially the melodic harmony, yet she can be a forceful as well, Obssession being a good example. How the two work in the vocal arrangements is as expected. Sometimes there's a male lead, another time she leads. Often it's in duet, Labyrinth, or tag team, On The Padded Wall. Yet that song, and State Of War among others, displays an often inherent problem within bands built upon heavy sharp riffage. The vocals get thumped on, pushed down, and such is the case across this album. Many times you can make out the synths more than the vocals. There are exceptions, possibly within Labyrinth. So, if you dig guitar-engined, rather intense, heavy power metal or like what you hear in the videos below, you will enjoy Arctic Void's Entangled. 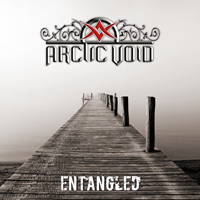 If you dig guitar-engined, rather intense, heavy power metal or like what you hear in the videos below, you will enjoy Arctic Void's Entangled.